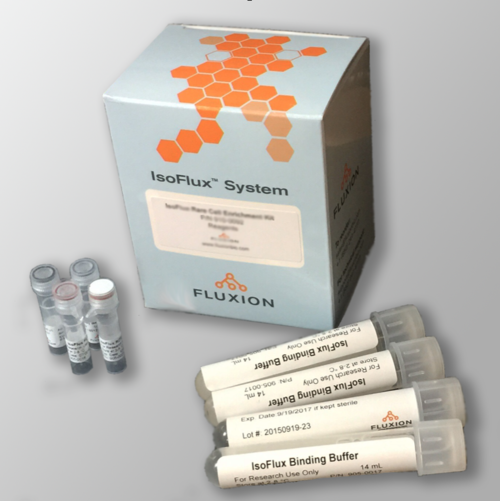 Two new kits were recently released for enhanced circulating tumor cell (CTC) isolation and recovery and that are designed to work exclusively with the IsoFlux Liquid Biopsy system. The Enhanced Recovery kit adds EGFR to the traditional EpCAM antibody, and the EMT kit includes EpCAM, EGFR, and two proprietary mesenchymal phenotype antibodies. The high efficiency and high purity of the recovered cells allows for the use of highly multiplexed analyses such as next-generation sequencing (NGS) for cancer mutational profiling. The new kits provide a higher level of performance while enabling recovery of a wider spectrum of cell types. The EMT kit is the first commercially available that targets the mesenchymal cell phenotype for CTCs that have undergone EMT, considered to be a potential contributor to metastasis.